Astronomical telescopes all require interchangeable eyepieces so that you can change the magnification, or in many cases substitute a camera for photography. Often, the telescope comes with one or two eyepieces only, and you buy more for higher magnifications or wider fields of view. The magnification you get depends on the focal length of the telescope and the focal length of the eyepiece. You divide the one by the other to find the actual magnification. A typical standard eyepiece may have a focal length of 25 mm. On a telescope of 900 mm focal length this will give a magnification of 900/25 = 36. The same eyepiece on a 1200 mm focal length telescope will give a magnification of 1200/25 = 48. And you can work out for yourself that a 10 mm eyepiece on the latter telescope will have a magnification of… that’s right, 120. The crucial thing here is that the magnification is higher the longer the focal length of the telescope, but the shorter the focal length of the eyepiece. So if you want a low magnification, choose the eyepiece with the biggest number on it. 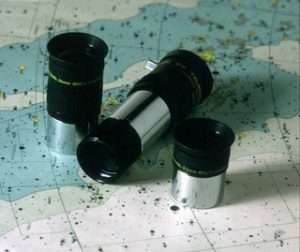 You might think you’d always want to use high magnifications, but in practice even expert astronomers start observing with lower magnifications, which give wider field of view, so that they can find the object they want and get it centred, then switch to higher magnifications if necessary. Oh, and in the jargon, magnifications are often referred to as powers. So, low power and high power. The other thing you need to know to start with is what Barlow lenses are for. These are not actually eyepieces, but they are adapters which typically double the power of any eyepiece they are used with. So a 2X (two times) Barlow will double the magnification of any eyepiece it is used with. If you have three eyepieces, of 25 mm, 10 mm and 7 mm focal length, getting one Barlow will give you six possible magnifications. If you are choosing eyepieces, bear this in mind so you can get a wide range of powers with the minimum outlay.